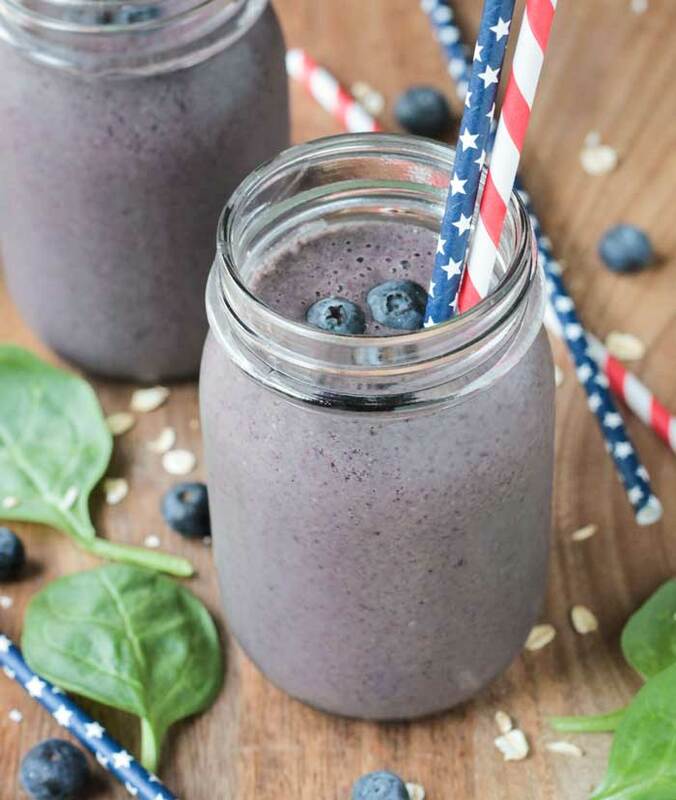 Blueberry Oatmeal Smoothie – All the fiber and staying power of a bowl of oatmeal, but in an easy, portable, drinkable form. Bonus – there’s greens in there! Do your mornings feel hectic? Do you often have plans to eat a healthy, filling breakfast, but never seem to have the time to make it happen? I feel your pain, friends! With 3 kids, their activities, my schedule, etc., sometimes a proper breakfast at the kitchen table just doesn’t happen. That’s why smoothies sometimes feel heaven sent. Your kids think they are drinking a milkshake and you can cram all the nutrition in there that you can imagine. 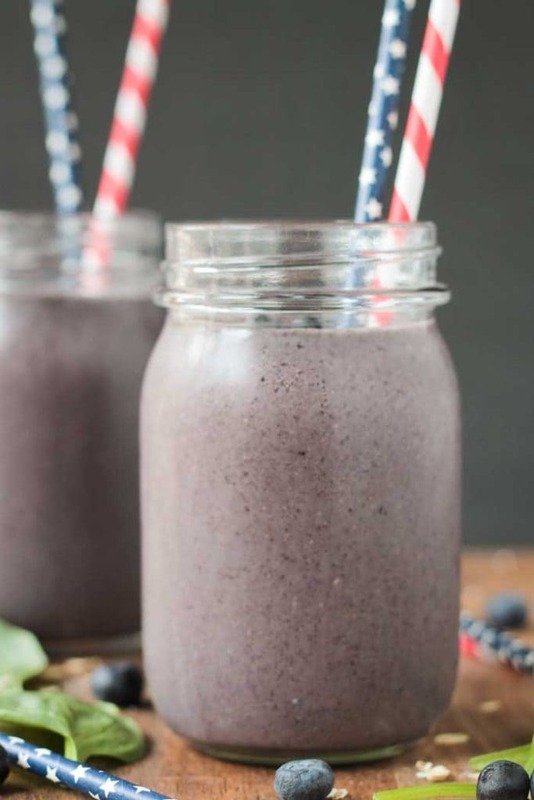 This Blueberry Oatmeal Smoothie (full of fiber, protein, vitamins and minerals) will fill you all up for your morning ahead and keep everybody happy. You know what’s great? Green smoothies that aren’t green. You know why? Because sometimes kids (and adults – you know who you are) are turned off by foods/drinks that are green. I’m not sure why – green is such a beautiful color, but whatever, I get it. So, pack in those greens in your smoothies and then use vibrantly colored fruits to cover them up! I chose spinach for this Blueberry Oatmeal Smoothie because it’s nutrient profile is especially impressive. It’s incredibly high in vitamin K, vitamin A, manganese, folate, magnesium, iron, B vitamins, vitamin C, calcium…it’s even high in protein and omega-3 fats. Wow! You WANT your kids to eat this leafy green, but I bet they don’t want to eat it plain, amiright? Another bonus with smoothies – they are super portable. Not only do we not have time to sit and eat breakfast some days, but sometimes we don’t even have time to slurp it down before we are running out the door. No problem – pour this into your favorite to-go cup and have breakfast on the way. Fueling on the go – what could be easier?! 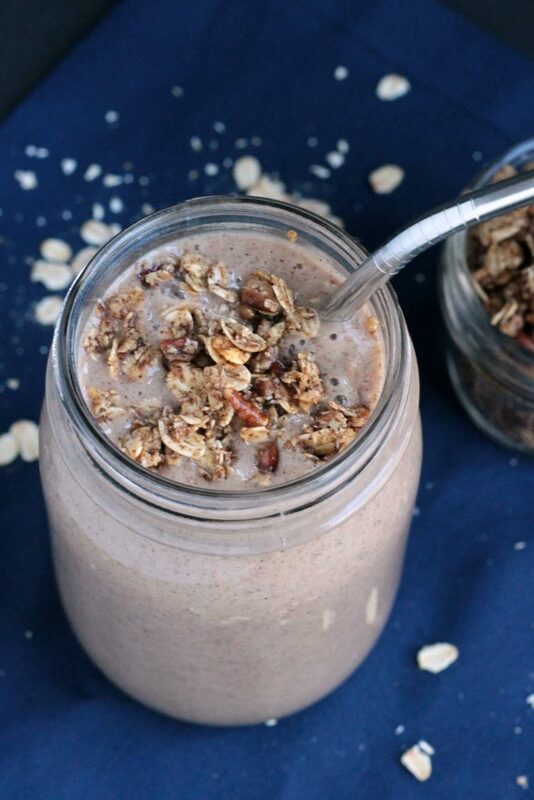 Don’t think this oatmeal smoothie is JUST for frantic mornings, though. If you do have time to sit, go ahead and enjoy this alongside a piece of toast spread w/ nut butter or whatever else your tummy desires. 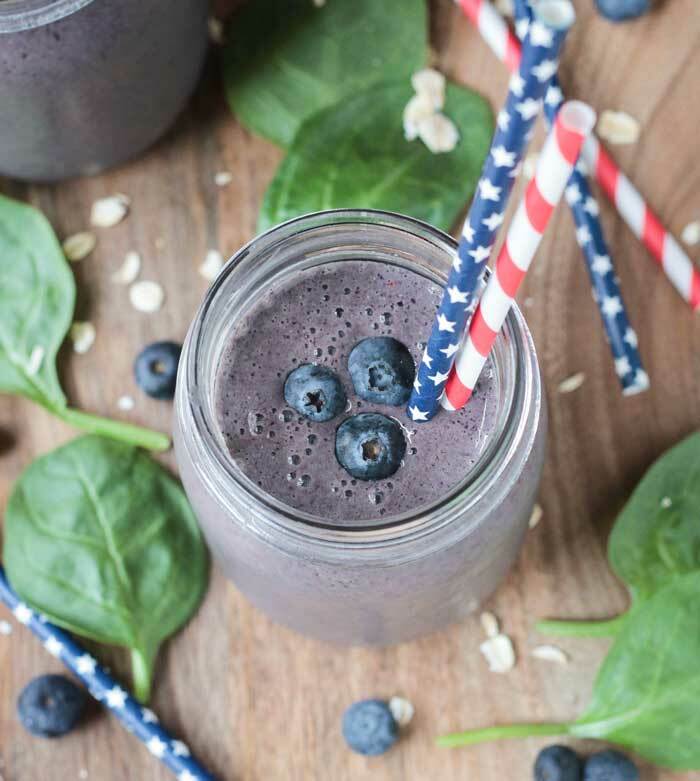 Give this Blueberry Oatmeal Smoothie a try and then come back and leave me a comment below with your feedback and star rating. I love to see your pics too! Snap a quick one and tag me @veggie_inspired #veggieinspired on social media. 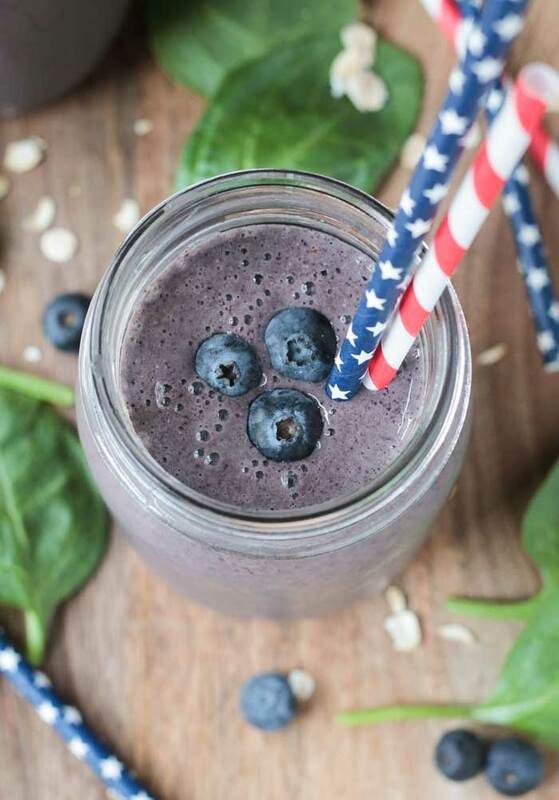 Blueberry Oatmeal Smoothie - Thick and delicious and loaded with nutrients. Shhh - don't tell the kids there's spinach in there! 1 cup unsweetened non dairy milk (rice, almond, soy, etc). I’m confused. Half a cup of oats alone is 150+ calories and the total listed calories is 194. By my calculations following the recipe listed the total calories is around 420 calories. Hey, Pedro. The recipe is for 2 servings and the nutrition facts are for one. Enjoy! Hope you love it, Pedro! Thank you for this! I wanted to make my daughter a smoothie for breakfast and I was all out of frozen bananas. Perfect! Great! So glad you liked it! Cashews, avocado, and even white beans all make great thickeners for smoothies too! Enjoy! Can you make this and have half one day and then refrigerate and have the next day ? Sure. You might need to re-blend it with a little extra plant milk as the oats will probably thicken up as they sit, but it will still be delicious. Enjoy! I would love to try this recipe but I am allergic to maple! Can I just leave out the maple syrup or put something else in its place?, if so what? Hi, Jennifer. You can just leave it out. Or you add a few pitted dates for a bit of sweetness. Enjoy! Ooh, with maple syrup, too. It’s like blueberry oatmeal pancakes in a jar! Yes!! I hadn’t thought of it that way, but yes! Thanks, Alisa! You should try it, Vanessa! Definitely filling and thick and creamy! Great flavor too! My absolute favorite ingredient to put in a smoothie is blueberries! 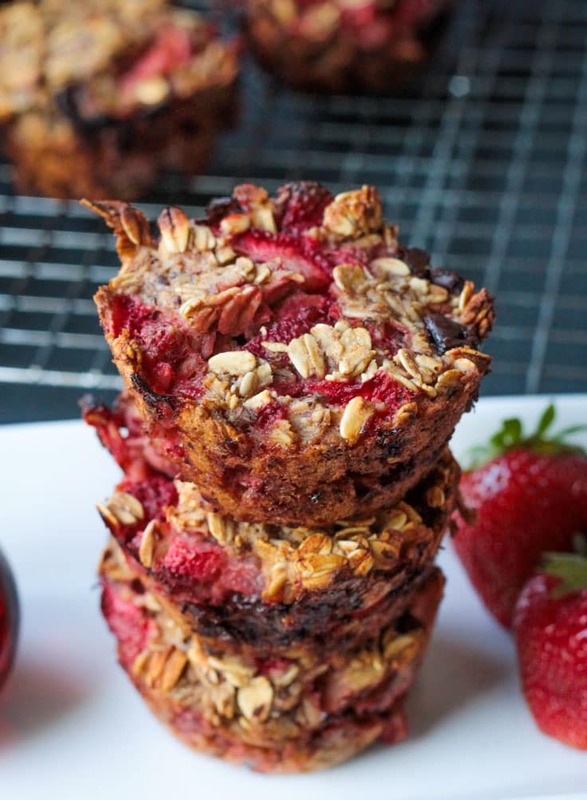 Adding oats would make it that much more amazing! Such a great idea! Blueberries are the best! Thanks, Brandi! Blueberries are my FAVOURITE things to put in smoothies! I love your patriotic spin on it 🙂 Gorgeous! Thanks, Aimee! Frozen blueberries are just so good!! 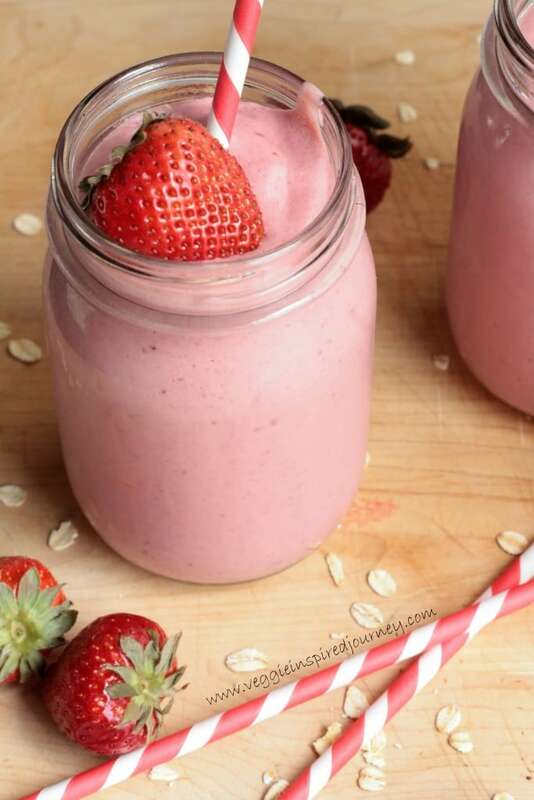 Smoothies are my go to breakfast, especially in summer! I love oats in mine for added texture. And of course blueberries are so good right now! The best of all worlds. Sounds so healthy and delicious. Thanks! This looks so good! Also, I super love your patriotic straws – too cute!